With the second solo album, even more pieces fell into place, and a new artist with a distinctive voice finds a more mature expression. Everybody Knows This Is Nowhere was released in May 1969 on Reprise Records. 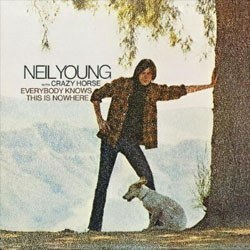 Neil Young recorded with Crazy Horse for the first time. The producers were Neil Young and David Briggs. Compared to the debut album, Neil Young the second album got more tempo overall and the production is clearly better. It could also be claimed that this album lacks some of the beautiful harmonies that belong to songs like “Here We Are in the Years” and the imagination in “The Last Trip to Tulsa”. The opening song "Cinnamon Girl" was written for the previous album and the hard rock guitar driven sound own similarities with that on "The Loner". "Cinnamon Girl" also separates from the other songs on Everybody Knows This Is Nowhere. But there are also acoustic songs with a slow tempo like “Round & Round (It Won’t Be Long)”. The mood is still gloomy in many ways as the previous album, that else with song titles like “Everybody Knows This Is Nowhere” and “Round & Round (I Won’t Be Long)”? And he looks in your eyes and he cries. On "Cowgirl in the Sand" everything works. The lyrics are quietly accusative, while the lead guitar, alternately soaring, piercing, and driving, keeps the song surging forward. But it is Young's singing which is the real key to the success of this track. "Cowgirl in the Sand" demonstrates quite clearly the peculiar depths of Young's voice. It indicates how rock manages, again and again, to triumph over high school music teachers and their legions. Everybody Knows This Is Nowhere was a personal triumph for Neil that finally accomplish things that he didn’t have succeeded with before. In Buffalo Springfield, he had to abandon some of his ideas and at the first solo album, Neil Young, the sound of the recordings weren't able to get through the mixing. The companionship with Crazy Horse resulted in longer guitar solos and Neil seems to be more secure in his singing.